The Static Single Assignment (SSA) form is a predominant technology in modern compilers, enabling powerful and fast program optimizations. Despite its great success in the implementation of production compilers, it is only very recently that this technique has been introduced in verified compilers. As of today, few evidence exist on that, in this context, it also allows faster and simpler optimizations. 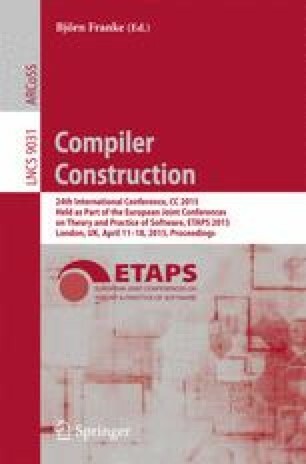 This work builds on the CompCertSSA verified compiler (an SSA branch of the verified CompCert C compiler). We implement and verify two prevailing SSA optimizations: Sparse Conditional Constant Propagation and Global Value Numbering. For both transformations, we mechanically prove their soundness in the Coq proof assistant. Both optimization proofs are embedded in a single sparse optimization framework, factoring out many of the dominance-based reasoning steps required in proofs of SSA-based optimizations. Our experimental evaluations indicate both a better precision, and a significant compilation time speedup. This work was supported by Agence Nationale de la Recherche, grant number ANR-14-CE28-0004 DISCOVER.